Since 1945, in thousands of homes plus leading industries, motels and restaurants, our water treatment solutions have proven to be effective, reliable and trouble-free. We have successfully completed thorough examinations and are certified by the Water Quality Association, the nonprofit organization representing the water treatment industry. 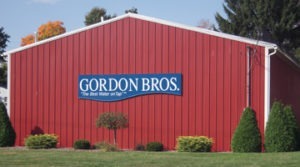 Gordon Bros. Water is a leader in the water treatment industry. When there is a new solution to a water problem, Gordon Bros. Water is among the first in the nation to know about it. Gordon Bros. Water is an authorized, independent Kinetico dealer. We were founded in 1945 by Lloyd M. Gordon, a true pioneer in the brand new industry of water treatment. Lloyd Gordon passed away in 1988, but he left his mark upon this company and upon our entire industry. He was a founder and the second president of the (now international) Water Quality Association. Lloyd was instrumental in forming the Ohio Water Quality Association and served as its president. Over the years Lloyd Gordon received numerous honors and awards from these industry organizations and others, such as the American Water Works Association (AWWA). Everyone at Gordon Bros. Water strives to preserve Lloyd Gordon’s legacy – which is to provide our customers with the best water treatment equipment, at the best price, backed by the best service we can deliver. Gordon Bros. Water received the Torch Award (Honorable Mention) at the national convention of the Better Business Bureau in Nashville. The Torch Awards are presented to companies for ethics in business, and we were selected from among hundreds of businesses nationwide to receive this honor. In recent years Gordon Bros. Water has been voted the “Best of the Best” by readers of newspapers like the Salem News and the Warren Tribune-Chronicle. We were chosen #1 in both Water Treatment and Drinking Water categories. Gordon Bros. Water has nearly 40 employees to serve you! Chairman of the Board – Edward P. (Ned) Jones, III.